Sloane knows better than to cry in front of anyone. With suicide now an international epidemic, one outburst could land her in The Program, the only proven course of treatment. Sloane’s parents have already lost one child; Sloane knows they’ll do anything to keep her alive. She also knows that everyone who’s been through The Program returns as a blank slate. Because their depression is gone, but so are their memories. Teen suicide has reached epic proportions, so the authorities say. It often starts with grief or mild depression, crying or showing strong emotions. You need to pretend, to keep up the facade while those around you would rather dose themselves with 'Quick Death', it's better than being dragged, kicking and screaming into The Program. Sloane's brother committed suicide, leaving a grieving family and friends. Sloane still has her best friend and boyfriend to keep her well. They say grief and depression is an illness. The Program will help you find your way back to health, taking all of your sad, emotive and depressive memories and erasing them. When Sloane is finally admitted, she'll do just about anything to retain something to help her remember, with the hope that she wont forget her memories, or herself. She doesn't want to forget Miller, she doesn't want to forget best friend Lacey, or that her brother took his own life. Most of all, she knows she could never forget James, the boy with the golden locks that promised he would keep her safe. With the program statistics showing a perfect success rate, teens being returned as empty shells, what is leading normal and emotionally healthy teens into despair and suicide? The Program could be the elephant in the room for quite a number of teens nowadays. The awkward conversations that adults try to engage in when they see a warning sign, that something may be wrong with their child. The Program isn't far from that aspect, in theory. Parents, teachers and adults seeing depression or emotional turmoil in teens, believing the only way to keep them safe from themselves, is to call the authorities and have them committed. What they are seeking are emotionally, well adjusted and complacent teenagers, boring, and devout of life. Leaving them only with happy, fond memories. Moulding them into Stepford children. 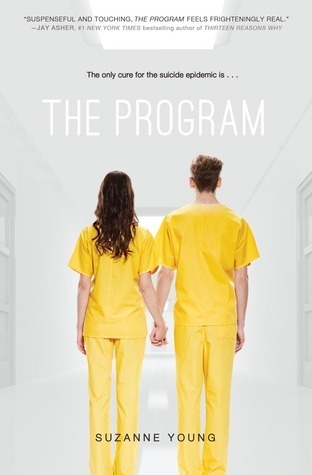 I really enjoyed The Program, and felt it was more of a creepy contemporary romance novel with science fiction aspects. Sloane is a normal teenage girl, grieving over what her life has become and forced to keep her emotions locked away. This is her story and you'll want to fight the system alongside her the entire way.